Something Wild and Unruly: I am in LOVE with my new office. I am in LOVE with my new office. I feel like the queen of everything in here. It's awesome. I have a houseful of people that I dearly love more than anything in the world. But. They are so needy! 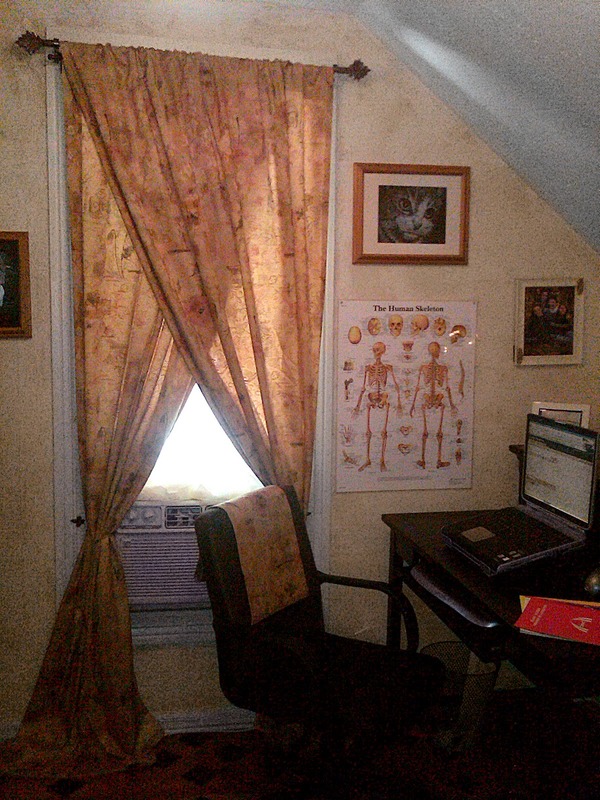 After spending the last couple of semesters setting up ad-hoc study areas around the house (none of them comfortable) and then spending my summer 16-day statistics marathon at the kitchen table with the noise and the questions, and the chatter, all the while glaring at my family with violence in my eyes, I finally have a real home office! One of the best features? A door - so I can close it and thus reduce the incidence of glaring at my family with violence in my eyes. I made the curtains from some really decadent fabric I bought at Hobby Lobby and then used that iron-on fabric glue to make the hems and seams. I don't sew. It's not that I can't sew. It's that I don't. I love the fabric so much, I couldn't bring myself to discard the last of it, and instead made it into a chair-back coverlet. Here I will work out the last of the bills, loose ends, and other headaches before school begins. After school is underway, this will be the CNS of my academic life.